Abrams and co-creators Alex Kurtzman & Roberto Orci...chiefly credit the work of David Cronenberg for sending them into their own 'Videodrome' playground of body-threatening, science-gone-wrong invasiveness. 1028 min. FOX. Director: Brad Anderson. Cast: Joshua Jackson. Teleportation, mind control, astral projection, invisibility, precognition, nanotechnology, psychokinesis, spontaneous combustion, reanimation, artificial intelligence, dark matter, suspended animation, cybernetics, transmogrification...it's "pseudo-science" fiction, J.J. Abrams style, on FOX's Fringe. Flashbacks to the heyday of The X-Files are forgiven (the second season premiere of the show openly encourages them), though Abrams and co-creators Alex Kurtzman & Roberto Orci—the three prime movers of the Star Trek feature-film revival—chiefly credit the work of David Cronenberg for sending them into their own "Videodrome" playground of body-threatening, science-gone-wrong invasiveness. Like Star Trek, Fringe revolves around a trinity of weirdly complementary characters: FBI Agent Olivia Dunham (Anna Torv), exasperatingly scatterbrained genius Dr. Walter Bishop (John Noble), and his sarcastic and angry son Peter (Joshua Jackson). By the end of Season One, these three are hardly as endearing as Kirk, Spock and McCoy, but they're certainly more complicated, in and of themselves and in the ways they are inextricably linked. Olivia is living with the sting of having been betrayed by her dead boyfriend and work partner John Scott (Mark Valley), and she shows soulful signs of latent romantic interest in her current workmates, FBI Agent Charlie Francis (Kirk Acevedo) and Peter. Olivia also turns out to be bonded by tragedy to Walter, a sort of Dr. Frankenstein with a litany of past crimes regularly surfacing to haunt him. One of these sins also pertains to an unaware Peter, who has slowly warmed to his father's best intentions and chosen to see his glass as half-full. Like The X-Files and Abrams' Lost, Fringe is capable of both stand-alone storytelling and serving an ongoing "mythology." Fringe does both pretty well, but the final episodes of Season One suggest that its strength will be in the mythology, premised on a doozy of a science-fiction idea that has never played so prominent a role in a weekly series. Meanwhile, the weekly pulp "Weird Tales" are as wack-tastic as those of The X-Files while always remaining tethered, if not rooted, to actual scientific theory. The core team—joined by even-tempered FBI Agent Astrid Farnsworth (Jasika Nicole) and a cow named Gene— works out of a Harvard laboratory as they investigate a web of bizarre and terrifying cases the FBI has linked in what it calls "the Pattern." The cases range from everyday spontaneous combustion to "mind over matter" killer butterflies with razor-sharp wings. No one is safe, except perhaps "The Observer" (Tony winner Michael Cerveris), an omnipresent, hairless weirdo whose imperative seems to be "look, but don't touch." In a twist that capitalizes on contemporary paranoia, the shadowy bad guys come in two forms that may turn out to be one: the corporate behemoth Massive Dynamic and the terrorist organization ZFT, operating by a manifesto called "Destruction Through Technological Progress." Both groups have ties to one William Bell (Leonard Nimoy, Star Trek's original Spock), who is "founder of Massive Dynamic, one of the richest men on the planet," and former lab partner to Walter. His number two at Massive Dynamic is Nina Sharp (Blair Brown of Fringe inspiration Altered States), who silkily promises cooperation "Anything you need" while perfecting obfuscation. Adding to the complexity, Nina used to "spend time" with Walter and currently does the same with Olivia's superior, Agent Broyles (Lance Reddick). It's a hallmark of Abrams' series Alias, Lost and now Fringe to bring feature-quality blockbuster genre stylings to small screens. The photography, special effects, and makeup effects live up to this standard, as does the music by Abrams regular Michael Giacchino (Star Trek). Most prominent on the series' directing roster are Brad Anderson (The Machinst) and Oscar-winning writer Akiva Goldsman, a consulting producer who wrote and directed pivotal Season One episode "Bad Dreams" (Goldsman also directed and co-wrote with Abrams the Season Two premiere). Season One guest stars include Jared Harris (as the creepy Mr. Jones), William Sadler, Michael Gaston, Ari Graynor, Randall Duk Kim, Chris Eigeman, and Billy Burke. TV series often stumble before finding their footing, and the early outings of Fringe were almost fatally mediocre. But viewers hung in long enough to make Fringe that rare freshman hit, by discovering a show that began to feel its oats, deepen its characters and establish a mythology that's primed to pay off in a big way over the coming years. Feel free to judge Fringe: The Complete First Season on Blu-ray by its cover. The lenticular slipcase cover is snazzy, and so are the five discs of content inside. There's a wow factor to the glossy hi-def transfers here, which offer substantial depth and detail as well as spot-on contrast and color. Every episode looks rock solid. As per Warner custom, the audio is "lossy" only: Dolby Digital 5.1. As DD 5.1 mixes go, these are certainly adequate in their surround sound, but serious audiophiles will be disappointed to have to adjust their aural expectations. Fringe on Blu-ray includes a couple of exclusives unavailable on the equivalent DVD set. The first is Fringe Pattern Analysis (HD), a feature in which scientific experts "dissect" six key Season One scenes using notes, photos and diagrams: "The Ghost Network" (3:53, HD), "Power Hungry" (4:55, HD), "The Equation" (3:14, HD), "Safe" (3:25, HD), "The Transformation" (3:54, HD) and "Unleashed" (5:55, HD). Secondly, BD-Live Enhanced Features include commentary on "There's More Than One of Everything" by writers Jeff Pinkner, J.H. Wyman, Akiva Goldsman and Bryan Burk. The rest of the bonus features take the form of commentaries and featurettes, most of them brief and episode-specific; these making-of segments come under the categories of "The Massive Undertaking" and "Deciphering the Scene," though it's unclear the distinction being made by these designations. Deleted Scenes also show up under the label "Dissected Files." For the "Pilot," Disc One includes commentary by Alex Kurtzman, Roberto Orci and J.J. Abrams; "The Massive Undertaking" (12:11, SD), with interviewees Abrams, Kurtzman, Orci, executive producer/director Alex Graves, special effects makeup man Gordon Smith, visual effects supervisor Kevin Blank, on-set carpenter Stephen Johnstone, gaffer Franco Tata, stunt coordinator Ken Quinn, Kirk Acevedo, producer Bob Williams, executive producer Bryan Burk, Anna Torv, director of photography Michael Bonvillain, Joshua Jackson, co-executive producer Brooke Kennedy, and script supervisor Angela Mastronardi; and "Fringe: Deciphering the Scene" (2:17, SD), which deconstructs Mark Valley's makeup process for the pilot, with Graves, Valley, Blank, and Smith. "The Same Old Story" gets a "Fringe: Deciphering the Scene" (1:50, SD) with 1st assistant director Christo Morse, director Paul Edwards, special effects makeup man Steve Kelley, VFX supervisor Christopher Scollard, prop master Peter Gelfman, and Elizabeth Stanley chatting about the makeup and effects used to bring Stanley's character to life. "The Ghost Network" gets commentary by Orci, co-executive producer David Goodman and Burk; "The Massive Undertaking" (2:09, SD) with location manager Lynn Powers, assistant to the director Michael Trisoli, director of photography Tom Yatsko, producer/director Frederick E.O. Toye, key production assistant Tom Tobin, and Kelley; "Fringe: Deciphering the Scene" (1:45, SD) with SFX coordinator Conrad Brink, Toye, first assistant director Gary Rake, Gelfman, Scollard, and SFX man Gilbert Gertsen; and "Dissected Files Sc. 81: I Believe He'd Want You to Have This" (1:54, SD). "The Arrival" gets "Fringe: Deciphering the Scene" (1:53, SD) with Michael Kelly, Yatsko, prop man Bentley Wood, Brink, Morse, and stunt coordinator Shauna Duggins, as well as "Dissected Files Sc. 36: More Things in Heaven and Earth" (:39, SD). On Disc Two, "Power Hungry" gets a "Fringe: Deciphering the Scene" (1:31, SD) with Duggins, Rake, Brink, director Christopher Misiano, and Jackson and "Dissected Files Sc. 39: The Man with the Birds" (2:09, SD). "The Cure" gets "Fringe: Deciphering the Scene" (1:34, SD) with director Bill Eagles, Kelley, Morse, and Gertsen. "In Which We Meet Mr. Jones" gets "Fringe: Deciphering the Scene" (1:34, SD) with Chance Kelly, Rake, John Noble, Scollard, and VFX supervisor Jay Worth. Lastly, "The Equation" gets "Fringe: Deciphering the Scene" (1:50, SD) with Torv, Gillian Jacobs, Charlie Tahan, director Gwyneth Horder-Payton, Duggins, and 1st assistant director Colin Maclellan, as well as "Dissected Files Sc. 9: Circadian Rhythms" and "Sc. 39: Tastes Like Construction Paper" (2:06 with "Play All" option, SD). Disc Three pairs "The Dreamscape" with a "Fringe: Deciphering the Scene" (1:58, SD) featuring Ptolemy Slocum, Scollard, Toye, Brink, and Rake; "Safe" with a "Fringe: Deciphering the Scene" (1:40, SD) featuring Torv, Duggins, director Michael Zinberg, and Maclellan; "Bound" with a "Fringe: Deciphering the Scene" (1:46, SD) featuring Rake, Kelly, and Tony Vincent; and "The No-Brainer" with a "Fringe: Deciphering the Scene" (1:38, SD) featuring Jake O'Connor, video playback man Philip Gleason, Scollard, Dave Bradford, and Susan Knight. Disc Four begins with "The Transformation," which comes with "The Massive Undertaking" (2:43, SD) featuring Noble, Neil Huff, Kelley, set dresser Russ Griffin, Lance Reddick, and Acevedo, as well as "Fringe: Deciphering the Scene" (1:44, SD) with Noble, Scollard, Reddick, and Acevedo. "Ability" gets "Fringe: Deciphering the Scene" (1:44, SD) with Kelley, Maclellan, Acevedo, Torv, Noah Bean, and "Dissected Files Sc. 4/5: Late-Night Questioning" (2:53, SD). "Inner Child" gets "Fringe: Deciphering the Scene" (1:31, SD) with Acevedo, Toye, Torv, Wood, and Jeremy Shamos, while "Unleashed" gets "Fringe: Deciphering the Scene" (1:56, SD) with Jackson, Noble, Torv, director Brad Anderson, Maclellan, and Wood. Disc Four also includes some meatier featurettes, with thoughtful spoiler alerts. First up is "Evolution: The Genesis of Fringe" (9:07, SD), which explores the series' development with Kurtzman, Orci, Abrams, Burk, head of television for Bad Robot Kathy Lingg, executive producer Jeff Pinkner, co-executive producer J.H. Wyman, Graves, and staff writer Zack Whedon. "Behind the Real Science of Fringe" (10:28, SD) focuses on what new media consultants Robert Chiappetta & Glen Whitman bring to the table in grounding the storytelling. Also interviewed are Orci, Kurtzman, Goodman, Edwards, staff writer Julia Cho, Eagles, and co-producer Brad Caleb Kane. "The Casting of Fringe" (9:21, SD) offers glimpses of audition tapes, including that of John Noble, by way of illustrating how the cast was selected. Participants include Torv, Acevedo, Blair Brown, casting director April Webster, Kurtzman, Abrams, Graves, Lingg, Reddick, Jasika Nicole, Goodman, and Orci. Disc Five includes the aforementioned Fringe Pattern Analysis. The episode "Bad Dreams" includes commentary by writer/director Akiva Goldsman and Jeff Pinkner, and "Fringe: Deciphering the Scene" (1:45, SD) with Jackson, Noble, Torv, Scollard, 2nd assistant director Patrick Mangan, and Brink. "Midnight" gets "Fringe: Deciphering the Scene" (1:48, SD) with director Bobby Roth, Torv, Trieste Dunn, Maclellan, director of photography Michael Slovis, electrician Ed Kelly, and Wood. "The Road Not Taken" gets "Fringe: Deciphering the Scene" (1:39, SD) with Rake, Torv, stunt double Don Hewitt, Jr. Season finale "There's More Than One of Everything" gets "The Massive Undertaking" (3:17, SD) with Kennedy, Torv, Leonard Nimoy, production designer Steven Jordan, Anderson, Kurtzman, Pinkner, and Abrams, and "Fringe: Deciphering the Scene" (1:37, SD) with Torv, Brink, visual effects assistant Jake Braver, and Scollard. "Roberto Orci's Production Diary" (13:06, SD) takes us back to the shooting of the "Pilot," with pyrotechnics supervisor Michael Langevin, Mark Valley, Jason Butler Harner, Heather Kadin of Warner Brothers and Rachel Bendavid of Fox, Burk, Joshua Jackson on hand to chat with Orci. 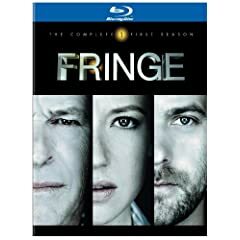 "Fringe Visual Effects" (15:16, SD) goes behind-the-computer-enhanced-scenes with Pinkner, Burk, Kurtzman, Abrams, Graves, Blank, Bonvillain, Valley, Torv, Goodman, Worth, lead compositor Johnathan Banta, lead 3D artist Michael Kirylo, Scollard, Gleason, Orci, Slocum, Toye, stunt double Jared Burke, Duggins, Braver, Maclellan, Whedon, Anderson, and Slovis. "Unusual Side Effects" (4:32, SD) is the Season One gag reel, always a welcome glimpse into the silly side of the actors' process. Lastly, "Gene the Cow" (2:46, SD) includes comments from Abrams, Lingg, Burk, Jackson, animal handler Susan Parker, animal wrangler Rick Parker, Torv, Nicole, animal handler B. Austin, and Edwards as part of a look at the three cows needed to play one role. While it's unfortunate that the BD set foregoes lossless sound or HD treatment for any of its video-based extras, the show's spectacular transfers and a more-than-complete bonus features package (with Blu exclusives) mean that hi-def is the way to go for collecting this impressively evolving series. All site content © 2000-2019 Peter Canavese. Page generated at 04/24/2019 06:55:41AM.